This project is an immersive installation named "Lull". It creates the illusion of an immersive surreal environment for the visitors by cascading visuals on translucent fabric walls combined with the help of dense fog, which I think is a very cleaver decision that they made. Through this new way of projection, the artists are able to bring late, 2d visuals into the third dimension and allow visitors to literally immerse themselves into the art work. I suppose the artist had to experiment a lot with the fabric walls to finally get the effect that they wanted. It also seems like the passion of the projectors and their own movements are are also something that needed a lot of tweaking. To quote the artists " Simple rules shape this ever-evolving animation, giving rise to organic abstracted patterns with complex behavior that teeter between order and chaos". This point came across quiet nicely with the final installation as it was able to a dreamy space just using very simple, organic shapes. "What is needed is a new type of design instrument. We need tools for search and exploration, rather than simply control and execution. We require tools that go beyond the fulfillment or optimization of simple functional requirements, and that allow us to investigate and advance more ambiguous factors of the design: soft criteria." The above excerpt from the project description effectively summarizes the core value of the artwork. Digital Grotesque II is 3.5 meter high 3D printed structure that explores both form and design/manufacture process. I am not familiar with grasshopper or any other parametric modeling tools, so I'm not sure as to how this form came about, or how much of it would be generative. But even if the form weren't completely generated by computer, I believe the result is a proof of the architect's statement that the computer "expands the imagination of the designer." Computer much exceeds the human capacity for speed and complexity in thought. I also love how the work falls right within the range of "effective complexity"--with both identifiable architectural details and incomprehensible chaotic distortions. Diffusion Choir by David Wicks is a massive kinetic sculpture consisting of hundreds of independently-actuated folding paper forms. 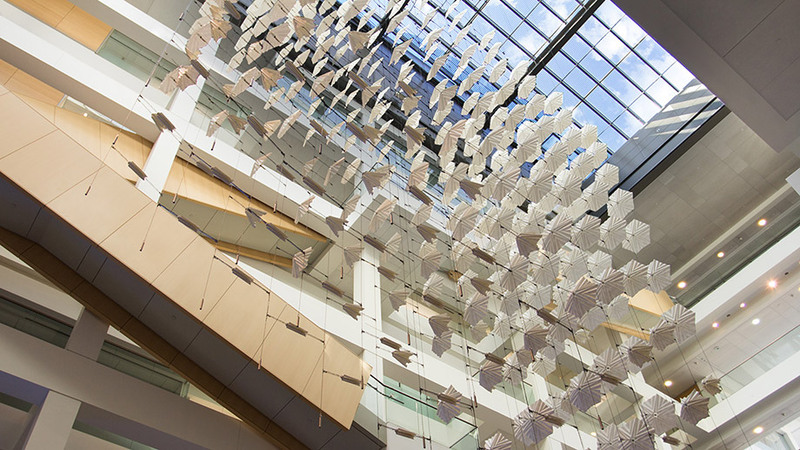 These forms are powered by a flocking algorithm that makes them appear to have the flapping motions of birds. This piece stuck out to me particularly because of its use of an art form that I am newly interested in and an art form that I was interested in a number of years ago: generative art and origami. I used to spend hours trying to fold, with occasionally moderate success, intricate origami models. Recently, though, I have been increasingly interested in algorithmic generative art. Seeing the two combined, both of which begin with relatively simple concepts (bits for generative art and just a piece of paper for the origami) and turning them into something so complex amazes me. My only real piece of criticism for the installation is that the artist seems to emphasize the idea that each item in the installation portrays a bird in his statement for the piece. While I can see the image quite clearly from the bottom, from the side (the piece is designed to be viewed from all sorts of angles), the image of birds gets lost for something far more abstract. I had completely forgotten I had come across Mokafolio years before until Golan presented his work again a couple weeks ago. I had loved the artful, analog quality of his work then, and I still do love it. When I first encountered his work, I had no idea that there was so much technology behind the pieces. I especially love the vending machine pieces because not only are they generative, they are so in a very engaging way. Vending machines are great because the user never knows exactly what they're getting, yet they choose to receive something anyway. In a lot of the generative art examples, there's a certain "generative art" aesthetic that is extremely telling of how the results are made. I love Mokafolio's work because it's decidedly not that--not that any aesthetic is better or worse than another, I just think in terms of uniqueness, this work stands out (going back to Galanter's Problem of Uniqueness). In the fall of last year I went to my first lecture series at CMU and to see Ian Cheng it really inspired me. I specifically enjoyed his work Emissaries. Emissaries for me was really interesting because I was really able to see the artist and his style in his work beyond the 3D models and textures done by him. The movement and behavior of these kind of microcosms just had a general "brush stroke" to them almost that I thought was very dreamy and unique and in the same way a little haunting. Additionally, all of his pieces were up for an extremely long time, on display but not tangible the entire time. This made me feel like i was really watching this tiny world grow and develop in front of my eyes. microsurface video from Maayan Albert on Vimeo. 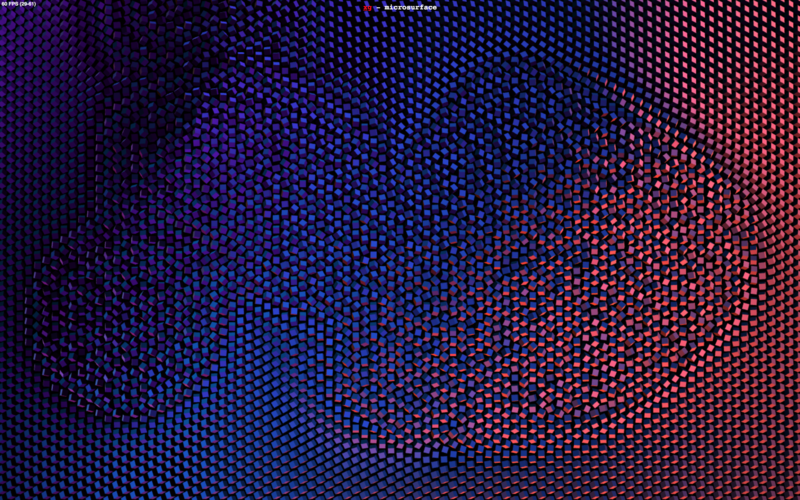 This is a generative art project that features a series of multicolored cubes that rotate when you move over them. I admire how engaging the work is and how the individual cubes form a larger pattern. I suppose that this algorithm simply generates many three dimensional cubes that are programmed to rotate in response to the mouse. Some easing function is probably involved in the motion and the colors are likely generated by perlin noise or some similar function. I admire how organic the motion feels and how it is juxtaposed by the technological modernity implied by the colors and medium. This project by Marius Watz particularly caught my eye. 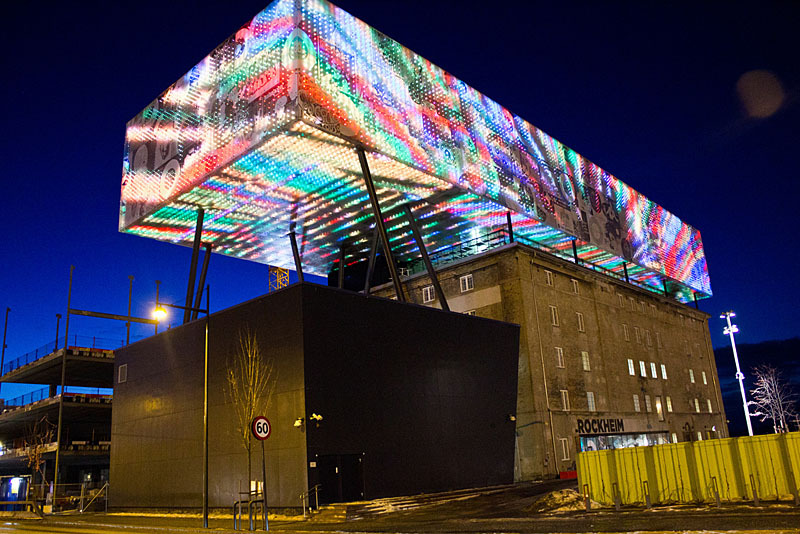 It's a generative video for the LED media facade of Norway's national museum of pop&rock. What makes it particularly compelling for me (as may be painfully obvious) is its direct link to architecture. I've rarely seen generative art being linked to built architecture before, and this one is particularly compelling. Not only because of the striking image it makes, but also because of the algorithm that generated it. It looks like Watz used a 2-D ribbon explosion (for the lack of a better word) algorithm in this project - which he then mapped onto the 3-D facade. The 2-D image has a certain animated quality about it which I think is partly the result of some stochastic process. This, combined with the multitude and composition of colors, makes the image very aesthetically pleasing to me - which then directly impacts the architecture. 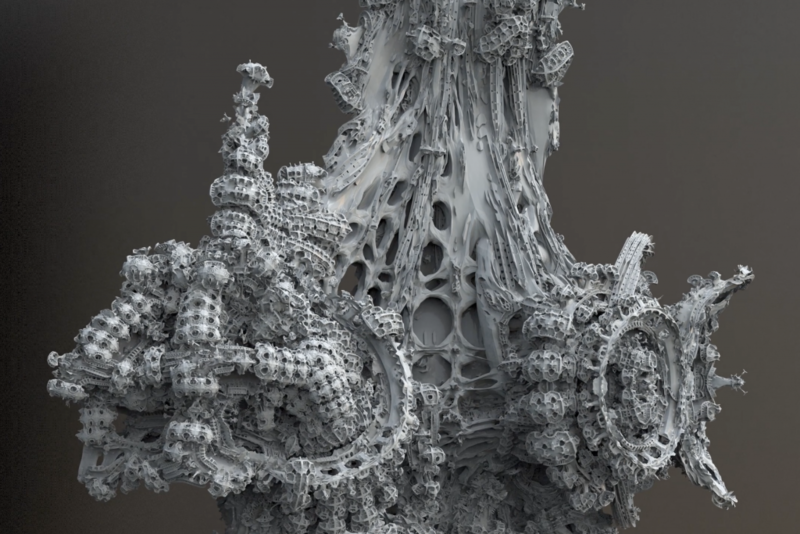 Michael Hansemeyer's Digital Grotesque II is an eleven and a half foot tall, 3D printed sandstone structure which was modeled using generative architectural algorithms. In topology, a cube and a sphere are considered the same object, however a torus (donut) is not. The algorithm that designed this piece can start out with a topological sphere, and continue to add holes and loops indefinitely, so as to create any shape. The algorithm was incentivised to create stimulating structures through crowd sourced feedback in several cycles, each more fine-tuned than the last. I like this method because it puts most of the hard work in the beginning -designing the algorithm- and then allows the artist to become curator. Thus the sensibilities of the artist are very directly present in the artwork, because the artist serves as the reward function. And in this case, there were hundreds of people giving feedback to the computer, which even further complicates the notion of authorship for generative artwork. I would say that the effective complexity of the piece is a little past the complexity of fractals, because it shares a fractal aesthetic, but the rules of its creation are far more complex. 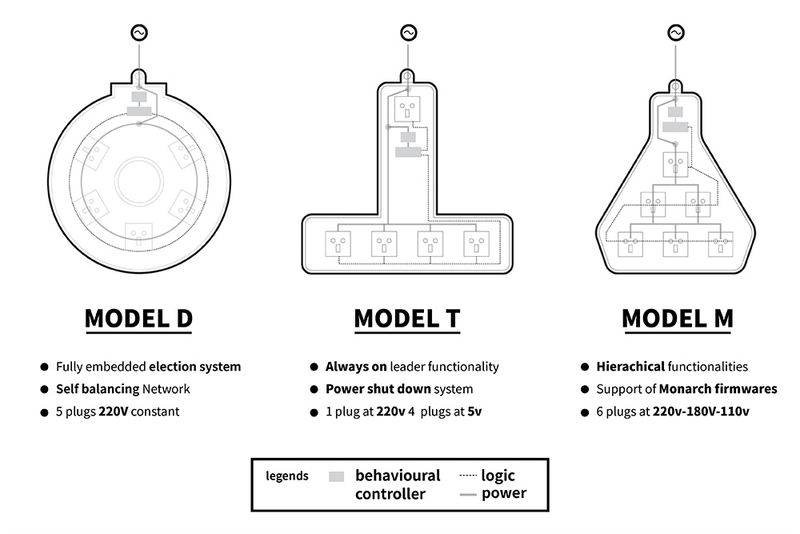 Politics of Power is an interactive installation piece that uses different "models" of plugs - Model D, M, and T - to simulate different ideological structures in the politics of networks by using different algorithms to distribute power between the lights which are plugged in. For example, in Model M, power is distributed hierarchically, where the topmost light gets the most power, and the bottom row gets very little. The "monarch" may randomly die, but this does not give any more power to those that were beneath it. I was intrigued by this project because it played with a dual meaning of the word "power" and was able to convey such a complex issue in a simple and entertaining way. I think this project alludes to a greater link between generative art and sculpture, one that can react to viewers and change its behavior accordingly. To take this piece even further, I think it would be exciting to be able to combine different hierarchical structures and see how they interact with one another - how a monarchy influences a democracy and the vying for power between them. The artists behind automato are Simone Rebaudengo, Matthieu Cherubini, Saurabh Datta and Lorenzo Romagnoli. Their work often deals with the ethics of technology, and the idea of how technology can be used to reflect human ethics.